I’m With Her will bring their unique blend of instrumental interplay and indelible harmonies to Pepperdine University's Smothers Theatre on Thursday, October 11, at 8 PM. The band will be supported by folk/bluegrass duo The Brother Brothers. 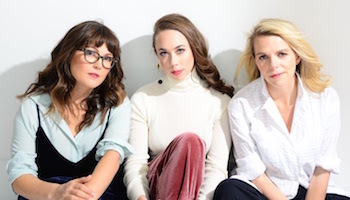 A band of extraordinary family-like chemistry and exquisite musicianship, I’m With Her features Sara Watkins, Sarah Jarosz, and Aoife O’Donovan. Collectively, the multi-Grammy-Award-winners have released several solo efforts, co-founded two seminal bands (Nickel Creek and Crooked Still), and contributed to critically acclaimed albums from a host of esteemed artists. Initially formed at an impromptu show at the Telluride Bluegrass Festival in summer 2014, the band have since released their debut album See You Around in February 2018. With See You Around, I’m With Her reveals their commitment to creating a wholly unified band sound. With each track born from close songwriting collaboration, the songs are both emotionally raw and intricate, crafted around the group’s finespun narratives and effortless harmonies. With See You Around, I’m With Her delivers a warmly textured yet stripped-down sound that proves both fresh and timeless. The Brother Brothers’ sound is striking and undeniably captivating. Often leaning towards the darker, moody elements of Appalachian folk, klezmer, and bluegrass traditions, their songs are laden with unison singing, compelling writing, and imaginative arrangements. They tour as an acoustic duo: David on cello and guitar, and Adam on the five-string fiddle. With individual storied careers in the Americana scene under their belts, the Moss siblings are finally teaming up to bring their experiences together. This performance is sponsored by the Pepperdine University Crest Associates. Ticket prices range between $10 and $45, and are required for admission. For additional information about this performance, and to purchase tickets, visit the Center for the Arts website.